This is your friendly spoiler warning. If you haven't seen the first episode in Doctor Who's season 8 two-parter, Dark Water, don't click any further. And trust me, you really don't want to be spoiled. I'll be honest — I really wasn't expecting Moffat to surprise me in this episode. Instead, there was not one but two proper, spine-tingling, didn't-see-it-coming surprises. The first, of course, was the brilliant reveal that the "heaven" weirdness that was tacked on to nearly every episode this season, was — thank God — not actually Moffat's musings on the beyond. When the more aggressively atheistic Russell T. Davies tried his hand at religion, it almost always came off as overblown and out of place. Instead, we find out that Missy and her creepy team have used Gallifreyan technology to trap the minds of the dying in order to convert them into Cybermen. So that was first big surprise — that someone could actually give us an interesting Cybermen plot. But more importantly, that even though I knew to expect the overused tragic androids in this episode, I was still taken aback by the reveal that the endless tanks of skeletons submerged in the special "organic matter" X-ray liquid were, in fact, the Cybermen themselves. Fun stuff. But of course the second and bigger twist of the episode came at the end: that the mysterious Missy is our new Master. At first, I was really pleased. I love Michelle Gomez — even though she's been dressed up to look like literally every Moffat femme fatale, she really owns her scenes and made the seemingly minor character a lot of fun. So to have it revealed that she may be a mainstay going forward is quite exciting. But where I get trepidacious about declaring my love is that this move does come off as a gimmick on Moffat's part. If you consider yourself a Doctor Who fan, you couldn't have missed the vicious, lengthy debates that raged this past year about whether or not it was time for a female and/or non-white Doctor. Many people rolled their eyes at what they felt was an attempt at political correctness, while others argued that it made little sense to limit the potential of a character that could be played by literally anyone. And while we wound up with Peter Capaldi, who has been nothing short of brilliant, the discussions surrounding Who's lack of diversity have stayed simmering in the background. 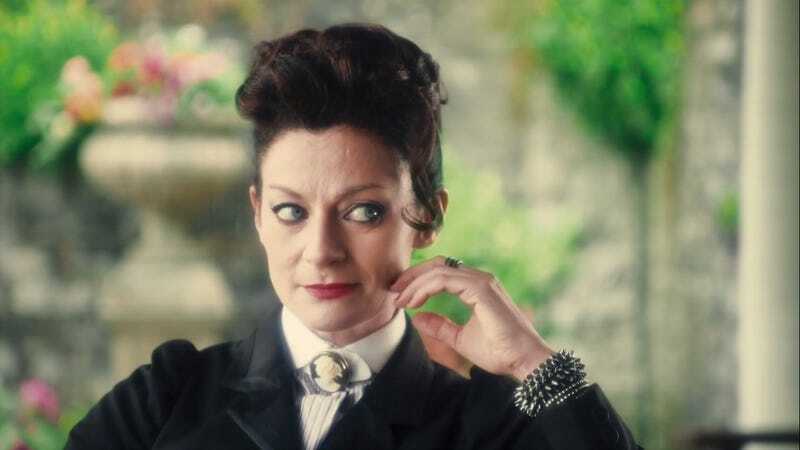 So is it cynical to suggest that Missy comes off as a concession on Moffat's part by offering up an old fan favorite character in a female package? Or that it could be him further thumbing his nose by stating definitively that the Doctor could've been a woman, and he simply chose to go with yet another white guy? And if the Master is still the Master, why does she suddenly feel the need to call the Doctor her boyfriend and make out with him at the first opportunity? I hear and acknowledge all of these concerns. And normally I'd be making them myself. But this time, I'm going to have to disagree. Firstly, because Michelle Gomez is a treasure. If we want to talk about using the right actor for the right part — regardless of gender or race — then we definitely have that in the form of the new Merry Poppins-esque Master. She's exactly what the Master should be: cartoonishly sinsister, fun and definitely insane. Like John Simm's most recent take on the character, she revels in that insanity. Unlike Simm's Master, she actually comes off as a legitimate threat. If I have one small complaint, it's that it would have been more fun to have her be the Rani, if only because it would be nice to start re-introducing other Time Lords since we found out that Gallifrey is back up and running. But if she is definitely the Master — and there doesn't seem to be any reason to doubt that she is — then I'm satisfied. On that note, this reveal would beautifully set up season 9 to be about the Doctor going out in search of Gallifrey — something that fans have wanted to see happen since the 50th Anniversary. A part of me would almost prefer to have a season of the Doctor travelling with the Master in a grudging truce while the two look for their home, rather than returning to the same format of Doctor-Companion random travel funtimes. As for all of the kissing... that's the one thing I'm still a bit worried about. It's hard to say how much of that was just about the Master enjoying getting under the Doctor's skin, and how much it's about Moffat's theory that the Doctor is irresistible to all women, even if they used to be men. The next episode will give us a better idea of just how much Moffat can or can't be trusted with a genderbending plot line, but otherwise I'm going to remain firmly optimistic that this is nothing more than a fun twist with a great actor.